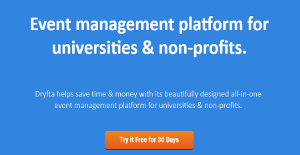 Dryfta is an event management system that specifically caters to universities and non-profits, helping them conceptualize, plan, and manage events all within a cloud-based environment. It is a comprehensive event management platform that comes with all the features and capabilities to help you plan your events and turn them all into a success. With Dryfta, you can create websites for faster and seamless event registrations, sell tickets via online channels, implement email campaigns, manage event schedules, manage your resources and manpower, and get on top of your attendees’ details among others. You can do all this from a single, unified dashboard, making event management fast and easy at every turn. Dryfta provides universities and non-profitable organizations with an innovative, cloud-based event management platform that boasts a rich feature set and capabilities to give them total control of their events, from planning to execution to post-event analysis, and more. From planning your events to realizing them, Dryfta gives you total control. From a unified dashboard, you and your team are able to perform your functions. Whether it’s managing and controlling your budget, setting and assigning tasks, to organizing your events, Dryfta simplifies and streamlines all your workflows. It is essential for any event organizers to keep track of their budget and expenses and ensure that they are able to work within their budget while achieving their intended ROI. Dryfta is loaded with tools to help you monitor your budget and spending as well as calculate your ROI. Dryfta lets you set up to-do lists that you can share with your team members. This allows you to see what needs to be done, what tasks have been accomplished, and who’s assigned to what, resulting in better task management, collaboration, and accountability. Access controls allow you to limit the number of people who can see tasks, especially ones that are confidential in nature. The software is also equipped with a CRM system that helps you gather, organize, and utilize attendee information. With all your attendee information accessible and easily visible in a single interface, you can easily deliver unique personalized experiences and services to each and every single of your attendees, thus helping turn your event into a successful endeavor. What Problems Will Dryfta Solve? 1. Dryfta provides users with an extensive Website builder tool that enables you to build a website for event registration purposes. You can tailor the website to suit your brand using your own CSS and HTML. You can add content pages just like you do in WordPress, upload photos and add categories, add and manage documents, embed Youtube videos, create custom widgets with custom forms etc. 2. Dryfta gives users with a no-frills ticketing platform that lets you sell tickets and event memberships easily via online channels. You can use your own payment gateway like PayPal and Stripe to accept online payments. 3. Dryfta is designed for the academia and therefore allows you to accept abstract submissions, add custom fields to the form, set up abstract submission start and end dates. You can also configure other settings such as enable/disable double-blind review, accept payments for accepted abstracts, display custom fields for co-authors and much more. If you are interested in Dryfta it might also be a good idea to analyze other subcategories of Best Event Management Software gathered in our base of SaaS software reviews. It is important to keep in mind that hardly any service in the Event Management Software category will be a perfect solution that can meet all the goals of all business types, sizes and industries. It may be a good idea to read a few Dryfta reviews first as specific software might dominate only in a really narrow set of applications or be prepared with a really specific type of industry in mind. Others might function with an idea of being simple and intuitive and therefore lack complex features needed by more experienced users. You can also come across solutions that cater to a broad group of users and provide a powerful feature toolbox, but that in most cases comes at a more expensive price of such a software. Be certain that you're aware of your requirements so that you purchase a software that provides all the functionalities you search for. How Much Does Dryfta Cost? We realize that when you make a decision to buy Event Management Software it’s important not only to see how experts evaluate it in their reviews, but also to find out if the real people and companies that buy it are actually satisfied with the product. That’s why we’ve created our behavior-based Customer Satisfaction Algorithm™ that gathers customer reviews, comments and Dryfta reviews across a wide range of social media sites. The data is then presented in an easy to digest form showing how many people had positive and negative experience with Dryfta. With that information at hand you should be equipped to make an informed buying decision that you won’t regret. What are Dryfta pricing details? What integrations are available for Dryfta? If you need more information about Dryfta or you simply have a question let us know what you need and we’ll forward your request directly to the vendor.